We’re big orchid fans here at The Flower Pot. So when Eastern Canada Orchid Society held their annual orchid show at the Days Inn Hotel in Downtown Montreal this weekend, we had to be there and show off Joanne Laroche’s work. The result was an arrangement that won the first prize this year! This was The Flower Pot’s 5th entry to this show. 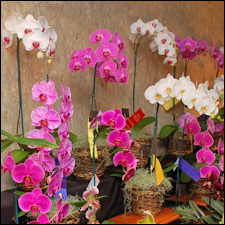 The show is one of two annual orchid shows in Montreal. 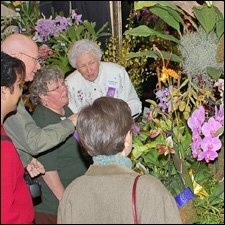 It was held between October 21 and 22, bringing together hobbyists, Orchid societies, and florists from everywhere in Quebec and other parts of Canada to have their plants judged and displayed to the public. This year there were 14 entries by Montreal florists. The criteria for judgding includes overall appearance, balance, workmanship, details, unity, and proper base of arrangement. 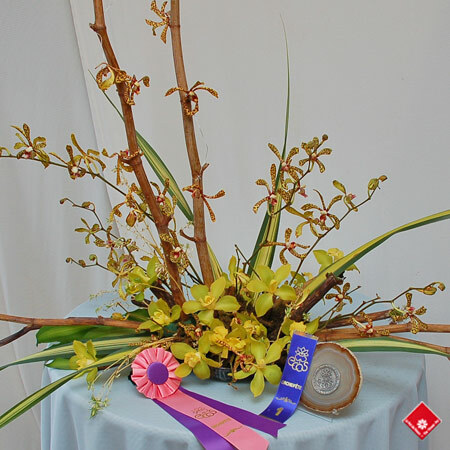 Our winning arrangement was made with large green cymbidium orchids, striped Arachnis (spider) orchids, Quebec bamboo, and offshoots of spider plants. Visitors came to admire the plants, orchidophiles traded growing secrets, some photographed, and others came to buy orchids. One particular orchid plant, a Stanhopea Wardii attracted a lot of attention from growers and visitors. A few of them stood in front of the plant, unwilling to move. The fascination was with the eight dangling buds of this plant, which are supposed to open up and 'give birth' at a very particular time. 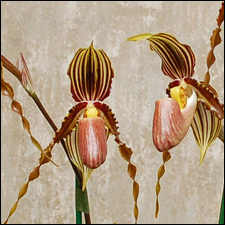 Unlike other orchids, these orchids last only four to five days. For those looking to buy orchids, this was a great opportunity. 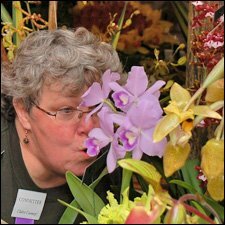 Besides being able to choose from a large selection of orchids, they had the chance to speak directly to the grower and get detailed care instructions. Vendors, who are a little reluctant to part with their “babies”, welcomed the enthusiasm and interest of the visitors. Here are some pictures for you to get a glimpse of the show. Visitor trying to get the Stanhopea orchid buds to open up. Fascination with the unusual Stanhopea orchid. 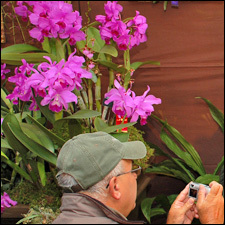 Visitor taking a picture of orchids. A lineup of popular orchids. 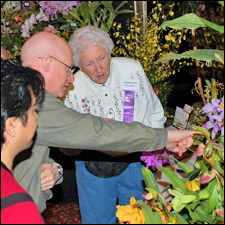 For more information about this orchid show, visit the website of the Eastern Canada Orchid Society. I was at the show, and those orchids were beautiful! Unfortunately, of the two I bought, one is already dying on me. Why? Gigi, what kind of orchid did you buy? I have never seen such a beautiful arragment of orchid. It is outstanding.. How did u manage to make it look so beautiful?